Summary: A typical household secretly teeters on the verge of collapse in this stark drama. 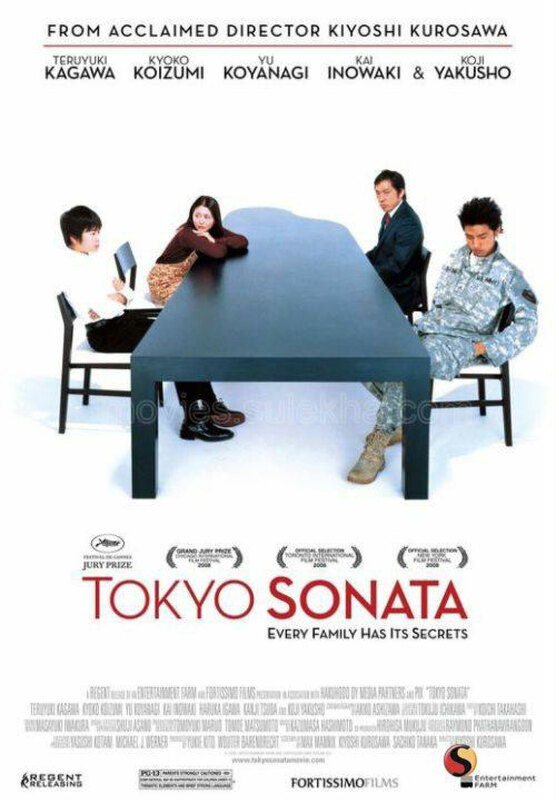 Businessman Ryuhei Sasaki is the principal breadwinner of a seemingly happy family in Tokyo, with Ryuhei looking after his teenage sons, Takashi and Kenji with his wife, Megumi. But what Megumi and her children don’t know is that Ryuhei is out of a job; his position was outsourced to a company in China, and he’s too ashamed to tell his family the truth. Ryuhei leaves home every morning as if he’s going to the office, but instead visits employment centers in hopes of landing a new job and eats lunch at a kitchen for the indigent. One day, while waiting for free porridge, Ryuhei meets an old friend who is in a similar predicament, Kurosu; Kurosu ends up bringing Ryuhei home for dinner so they can discuss their fictive day at work and maintain their subterfuge. Megumi, who is not as well-adjusted as she appears, one day spots her husband in a soup line while running errands, and discovers the truth about his employment status, though she doesn’t dare confront him. And as Takashi and Kenji begin drifting away from their emotionally distant parents, Kenji starts to suspect things are not as they should be, and begins spending his lunch money on music lessons in hopes of starting a career as a pianist.